Almost all of the Catholic universities worldwide can be directly controlled by the Vatican. Of the nine Catholic universities in South America only the Peruvian one is not bound by John Paul II's directive for these. This exception is the Pontifical Catholic University of Peru which, ever since it was founded in 1917, has remained outside the Vatican's chain of command. The local archbishop, Juan Luis Cipriani Thorne, who would normally enforce the rules, which are laid out in Canon Law and a papal edict, serves in this university merely as a figurehead. The Cardinal-Archbishop tried to get Peru to side with the Vatican by arguing that under the 1980 concordat the university was obliged to obey the pope. He argued that because the concordat allowed the Church to establish its own universities (art. 19) and because these, like other Church institutions, come under Canon Law, they also come under Vatican control. The message is clear, Catholic institutions needn't follow the laws of the land, only those of the Church. In other words, the state pays the piper and the Church calls the tune. 6. Jorge Rendón Vásquez, “Match entre el cardenal y la Pontificia Universidad Católica Del Perú” (“The match between the Cardinal and the Pontifical Catholic University of Perú”), Punto de vista y propuesta, 2011-09-01. Translated in the appendix below. 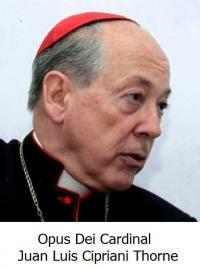 See also: “Vatican Foreign Ministers: Tauran (1990-2003) justifies Vatican diplomacy”, Concordat Watch. Right now the public is seeing an acrimonious dispute well on the way to becoming vitriolic and irreversible. Seemingly, relations between the Pontifical Catholic University and the hierarchy of the Catholic Church were flowing along with the clarity and brightness of an Andean mountain spring. Then all of a sudden the water becomes muddy and poisonous just like a river contaminated by industrial waste. The current cardinal, a high-profile militant in the political and ecclesiastical sect Opus Dei, appointed by Pope John Paul II at the end of the 1990s, has notified the Catholic University that he will nominate its rector and administer its assets. The rector, a lawyer, reminded him of the text of the relevant legal statutes of the university, at the same time he reiterated that he is a practising Catholic. The cardinal, who has several lawyers in his entourage, replied that the Catholic University must submit itself to Canon Law, under which the National Law is secondary and expendable, and that he, the cardinal, is the Chancellor of the university. With this, the argument stopped being just between these two parties and the cardinal has opened the match up to a wider public, a match that we were looking at with some disinterest and curiosity. The fifth article confers on the Episcopacy the right to participate in the life of the university through the Chancellor, plus five representatives to the university assembly and the academic director of Church Relations, as members of the university council. The sixth article states that the Chancellor is the archbishop of Lima, Primate of Perú (now the cardinal) whose functions are: a) to act as honorary president of the university; b) to ensure that the university fulfils its institutional objectives, carrying out the duties prescribed by the Catholic Church with regard to the teaching of theology, questions of faith and pastoral care within the university; c) maintain the university’s links with the Holy See and the Peruvian Episcopacy; d) nominate the Director of the Pastoral Advisory Centre, taking into account the views of the University Council and e) other functions according to the Statutes. Therefore, the cardinal, as Chancellor, reigns but does not govern. He is not part of any decision making body of the University nor may he issue executive orders. In fact, the five representatives of the Episcopacy in the university assembly have more power than he does, as they have one vote each, the same as the other eighty three assembly members, twenty six of whom are students. The cardinal does not like this. He wants to choose the rector, dictate the content and orientation of courses, be involved in the selection of the teaching staff and administer the finances of the university, currently the rector’s job. But as the statutes do not allow this he wants to change them. What does National Law say about this? University Law 23733, dating from December 1983, still in force with amendments, includes the Pontifical Catholic University in its scope but does not grant it special treatment. As with other non-state universities, it is defined as private and specifies the role of its administrative staff and assets. (arts. 6 and 70) Therefore, the rector should be elected by the university assembly, the same as all other public and private universities under this law. The statutes of the Catholic University reproduce the text of this law. No external Chancellor, or any other individual, has anything to do with choosing the rector, as he would like to see it designated. The 1993 Constitution confirms and reinforces the University Law, saying: “Each university is autonomous in its standard regime of academic, administrative and economic government. Universities are governed by their own statutes within the framework of the Constitution and the law”. (art 18) The text of the 1979 Constitution is similar. However, such clear guidelines mean little to the Cardinal and his advisers and they are invoking Perú’s treaty with the Vatican. This international treaty, signed on July 19th 1980, whose objective is to govern the relationship between the Peruvian state and the Catholic Church, was approved by the Law 23311 on July 24th 1980. In Article 19, the only one applicable to the matter being discussed it says: “The Church is free to establish educational institutions at all levels, in accordance with national legislation, in the field of private education”. Outside of this international treaty, no ruling from the Vatican, a foreign state, can compel the Peruvian state. Strictly speaking, none of these rules give the cardinal the right to interfere in the governing or administration of the Catholic University. Of course, the cardinal can criticise or offer advice whenever he wishes but his pronouncements would lack executive power to overrule what is mandated by the Peruvian Constitution and Peruvian laws. 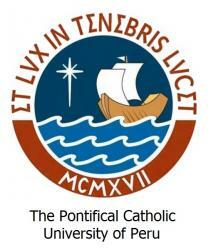 The Pontifical Catholic University is what it is. Its very existence is explained and survives by the will of its members within the framework of the Constitution and the laws of Perú. Interference from outside the bodies created by law and autonomously sustained is simply unacceptable. That the professors and students are mostly Catholic is a matter of individual freedom of conscience and their ideas of well-being, progress and other values. They can take decisions about this freedom as they see fit but only within the framework of the Constitution and the law. It is towards this freedom and the adherence to the Catholic faith of the university assembly that the cardinal has directed his arrows to get them, perhaps because of an overwhelming sense of obedience to the Church or out of fear, to modify the university’s statutes in the way he demands. The Catholic Church has acquired enormous experience – over nearly two millennia – in governing States and institutions. As any decision ‘contra legem’ would be invalid we can assume that the cardinal wants something else: to reach an agreement with the current authorities of the Catholic University that the modified statutes would confer on the cardinal the right to nominate the candidate or candidates for rector which would be voted on by the university assembly. He, the cardinal, would then govern by means of a puppet, leading the Catholic University towards the right and intolerance, burying its traditions of progress, liberty and social conscience that many of its professors, students and graduates have built up over more than fifty years. Assuming that he is successful, any agreement would also be null and void because it would take away the right of the assembly members to freely elect as they choose, a right enshrined in law. Peruvian Catholics are so because they accept the precepts of the Catholic religion, or because through it they believe they are closer to God, because they have been baptized in the Catholic faith, because they were indoctrinated at school, because their parents, neighbours and fellow citizens are, by a tradition of unknown origin or because they are indifferent. For many, religious practice is also part of social life. But the overwhelming majority of Catholics would not be willing to accept the decisions of religious leaders if they were contrary to their interests or if they contradicted national law. As you can see, this match is becoming almost as interesting as a game in the World Cup. I ask myself how many people would be attracted by a match between these two teams to settle the dispute on the field. Would it fill the University’s Monumental Stadium or only the pavements of Blvd. Parinacochas, where, long ago, they used to play five-a-side football?